Jack McConnell’s photographs celebrate Connecticut farms. For 45 years Connecticut photographer Jack McConnell has traveled the US and Europe for Fortune 500 clients shooting annual reports, advertising campaigns, and product catalogs. Along with CEOs he’s photographed astronauts, coal miners, Scotland Yard operatives, aerospace manufacturers, container vessel pilots, and many more worker-bees. For the past year, he’s turned his camera on Connecticut Farmers. Black & white portraits of 50 farmers are currently for sale and on display at Good News Café & Gallery in Woodbury until the end of September. Owner Carole Peck was one of the early adopters of the Local Food to Table movement back in the 80s. So Jack’s 54 photographs celebrating farmers are especially appropriate for the space. Six local farms included are MarWin Farm, Lavender Creek Farm, March Farm, Platt Farm, Ridgway Farm, and Mohawk Bison. When Jack asks folks how many farms are in Connecticut, they inevitably answer 50, 100, maybe 500. But when he tells them there are currently 5,977 farms (5 acres or more), they are astounded! 1,207 of these farms are located in Litchfield County, an increase of 23% in the past five years, and they produce $46,281,000 in product sales. It took 4.5 billion years to get the soil we need to grow the food we eat. Today farming in Connecticut is a $3.5 billion industry, supporting 21,000 jobs. 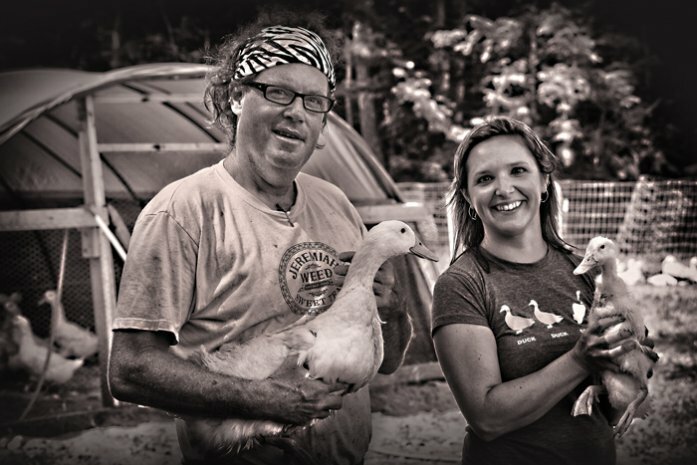 McConnell’s beautiful black & white portraits celebrate the enormous efforts of these present-day farmers, who care for their animals, maintain equipment, plant fields, harvest crops, and market their products to the public via farm stands, farmer’s markets, CSAs, and wholesale efforts to restaurants and school lunch programs. Click on www.JackMcConnellPhotography.com/new-projects/ to see an eight-minute slide show of CT Farms and Stone Walls, and go to Purchase to order prints. The heart-warming music was written for the video by songwriter Jack Collins, This Life Calls to Me.